In the end, we only spent one night in Caen. We were absolutely wiped (and famished) after our travel day on which we traveled by train from Bruges to Brussels and then on a high speed train from Brussels to Paris. We had three huge suitcases plus carry-ons that we dragged on and off each train and I’m glad the kids are older now so that they can literally ‘pull their own weight’ when it comes to travel. After the high speed train we needed to catch the RER train to Versailles where were to pick up another rental car. I found the travel around Paris and France to be relatively easy with the network of trains, the RER being a bit more of a commuter style train then the regular metro. Of course the best trains are the TGV Thalys trains because of how quickly they can cover such large distances. It took us just over an hour to travel from Brussels to Paris when by car the journey is over 3 hours. After picking up the car in Versailles, hubby navigated the nasty traffic until we got on the open road. Our biggest mistake was trusting the GPS. It pains me to say it because I am usually quite comfortable using a GPS to navigate. We had prepared the nuvi by downloading maps of France, Belgium and the Netherlands and we thought that cancel the need for a paper map. How wrong we were! The nuvi was on the ‘most direct route’ setting which sent us through so many small towns and tiny back roads that it added a full hour to our journey. I had originally thought a reservation at 8pm would have given us enough time to get to the restaurant but we ended up being about ten minutes late in the end. Not too bad really, considering how far we traveled to eat at A Contre Sens. I’m really glad I made a reservaton because there was room for only 20 people in the restaurant. I’m not sure if they do two seatings, but if they don’t only 20 lucky people get to eat amazing food per night. 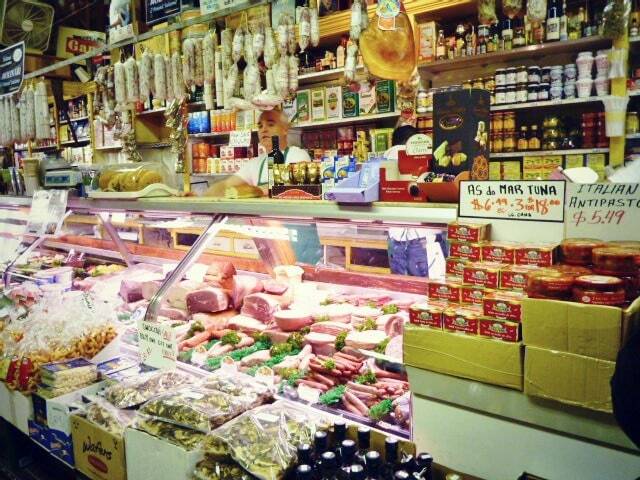 Our meal began with aperitifs. Since we were in the Calvados region, what better way to start with some local liquor. It is quite strong, so for an aperitif, the restaurant recommended blending it with some local apple juice. It was delicous and a taste of great things to come. When you order an aperitif, you also usually get small accompanying snack. 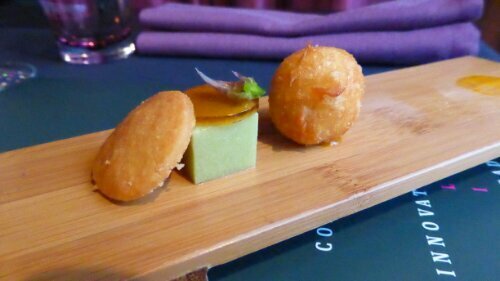 In this case, we were given a small board with a parmesan cracker, cube of gelled asparagus, and a cod fritteur. 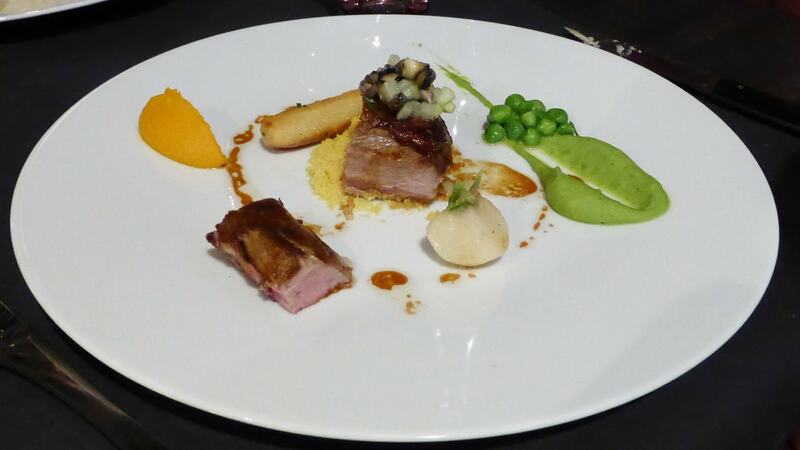 Next, our entree was a very interesting combination of flavours and textures. 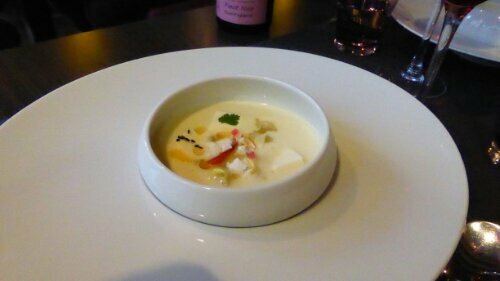 A cold potato soup with coconut creme, pimenton, cubed smoked herring, and tiny bulot. I had no idea what bluot were, but they were small, with a mushroom like texture and salty flavour. Halfway through our soup, hubby exclaimed ‘hey, I think bulot are snails!’ We all kind of stopped what we were doing to ponder for a while, then continued eating. It was our intention to try escargot in France so that was another ‘must eat’ crossed off our list. Even picky kid number two had some. Instead of ordering the chef’s tasting menu, she opted for just a main and desert off the carte. I guess the chef felt sorry for her and didn’t want her sitting there while the rest of us enjoyed our various courses because he ended up sending out little portions of each of our dishes for her to try. We all thought that was really nice of him and that is the sort of experience you will have if you ever get to Caen to try A Contre Sens. The next course was a beautiful cut of John Dory poached slowly in butter. The fish had almost taken on the consistency of butter with a little more bite. 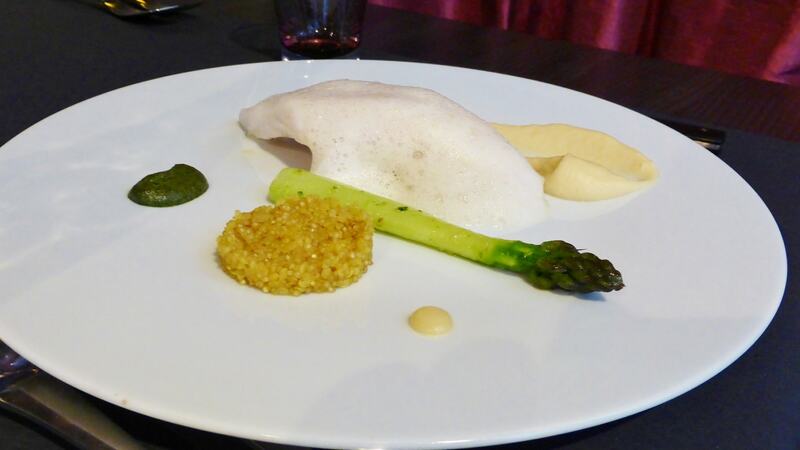 Accompanying the John Dory was a side of saffron couscous, a peeled and steamed asparagus, a tiny dot of lemon custard, algae sauce and a mysterious splotch. After the waitperson had explained our dish, he left us to ponder the ingredients of the mash. It was like a guessing game and we all had fun trying to figure out what those flavours were. 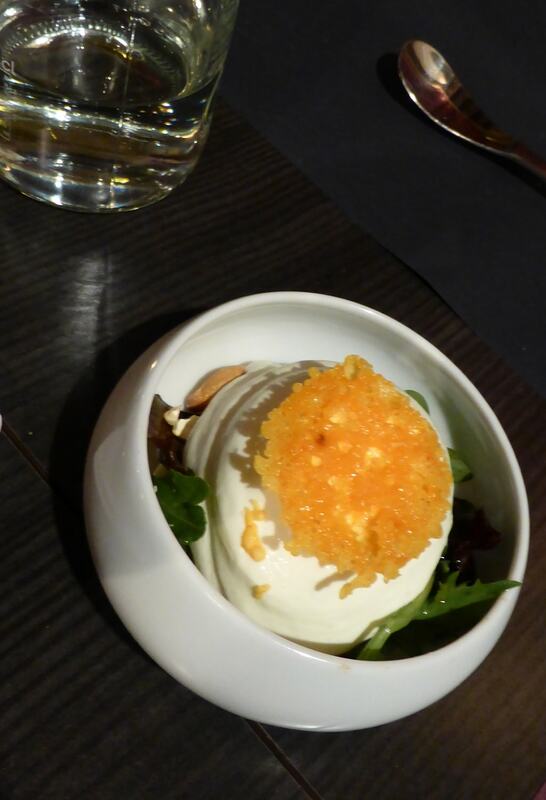 I thought maybe there was some apple in it but it turned out to be celeriac puree with tiny shrimp and toasted nuts. It was so smooth I would never have guessed. Next, we had a saddle of lamb which I am guessing is probably what we would call the loin. There were tiny dices of pickled cucumbers and bulot perched on top, a roasted turnip, mushy peas with mint, a ‘roll’ of potato and carrots scented with cumin. The lamb was quite flavourful but I’m still not a big fan of turnips. 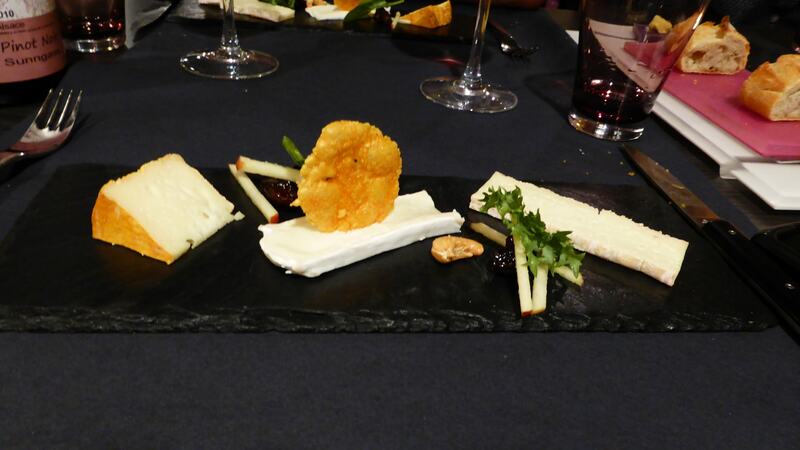 After we had our entree and mains, it was time for the cheese course. Before now, the presence of a cheese course was a myth for me. It’s not a part of eating out in Canada but in France it is very popular. We had the choice of a trio of Normandie Cheese or ‘transformed’ cheese. It was a language barrier moment until I figured out that transformed actually meant cooked. Both hubby and I went the traditional route but kid number one likes transformers..he picked the transformed cheese. What he ended up with turned out to be the dish of the meal! Just look at that silky Camembert Mousse! This dish had all the elements, creamy, silky, salty, sweet, nutty and acid. 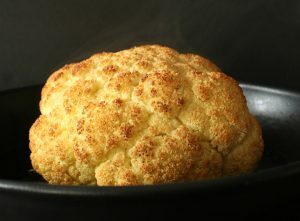 I would be forever happy if I knew how to make this dish. I suspect the rest of my family wouldn’t complain either. Though there was no way to top that Camembert Mousse we did end our meal on a high note with the delicious desserts or ‘Sensations Sucree’ as billed on the menu. 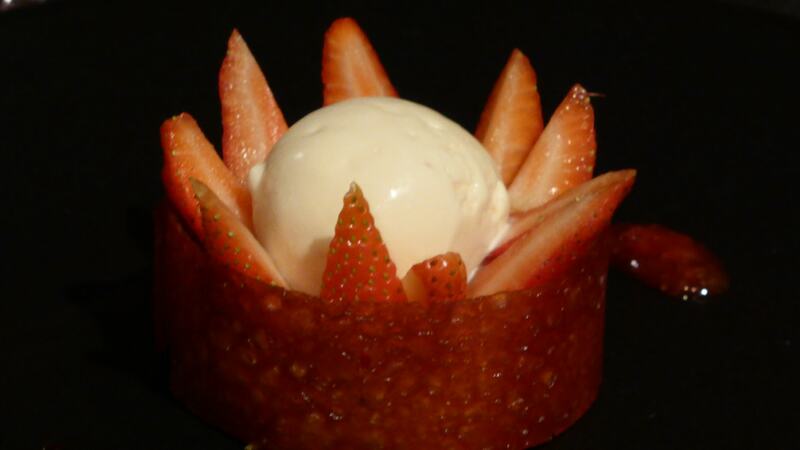 Mine turned out to be a Strawberry Cheesecake inside a caramel curl and topped with rose ice cream. It was a very light and refreshing way to end my meal. Hubby ended up with Rhubarb Cheesecake. 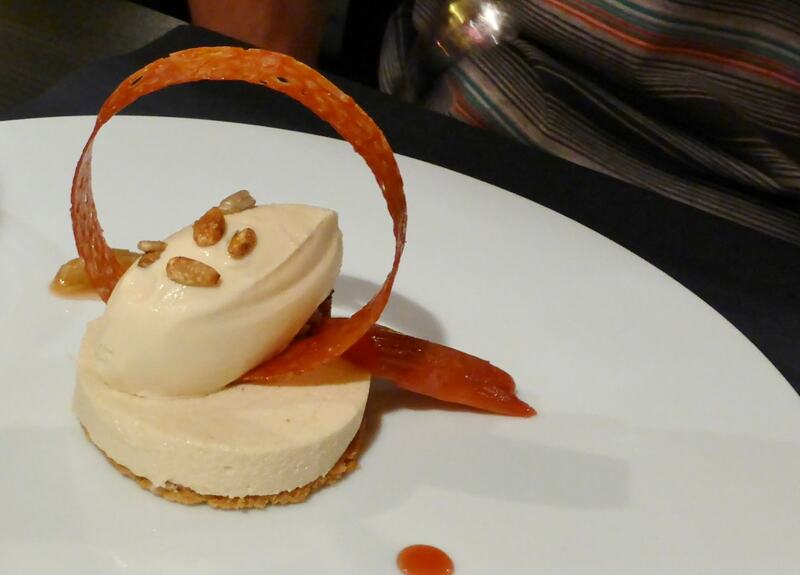 It had a nice stalk of roasted rhubarb, caramel curl, candied pistachios and local beer ice cream. He seemed pretty happy with it as you can see in the photo he had his spoon poised and ready for the moment I told him I was done taking photos. 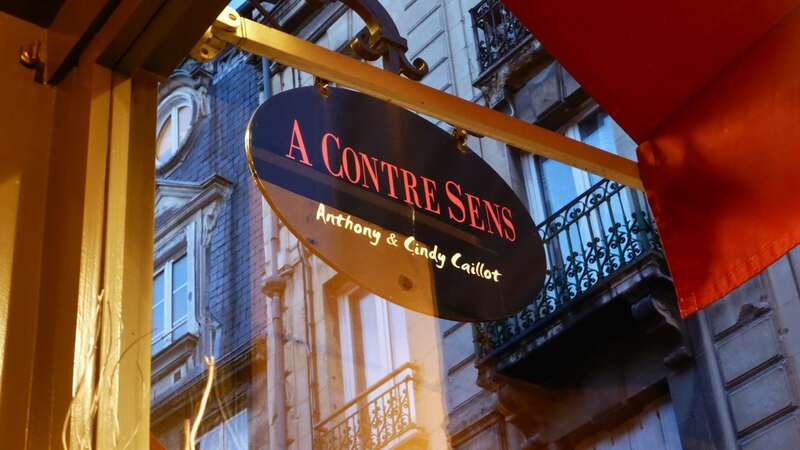 A Contre Sens was opened in 2009 by Anthony and Cindy Caillot. Anthony had previously worked at Le Chabichou in Courchevel, The Elysee Palace, Hotel Martinez in Cannes, with Eric Provost at L’Etrier – Restaurant du Royal Barriere, and cooked for French President Jaques Chirac. A Contre Sens has a lovely modern feel interior and excellent service. 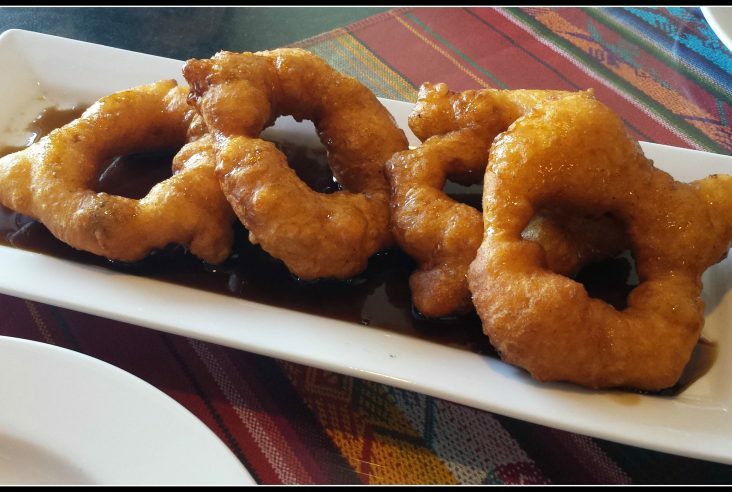 Chef Anthony aims to prepare ‘simple seasonal’ food well but there is always a very imaginative twist. This originality rewarded him with his first Michelin star in February 2012. Home : 12:00 to 2:00 p.m. / 7:30 p.m. 9:15 p.m.